On August 24, 2018, the U.S.-China Economic and Security Review Commission, a bipartisan American parliamentary body created by the 2001 National Defense Authorization Act, published a report on “China Overseas United Front Work: Background and Implications for the United States.” The report deals with the work of the United Front outside China in general, but it is a great interest for those studying religion too. The report maintains that many U.S. and Western politicians do not understand the importance of the United Front. They are partially justified because the United Front went into a long period of eclipse, but it has acquired again a central role under President Xi Jinping. The United Front is, theoretically, the alliance between the Chinese Communist Party (CCP), eight minor legally permitted parties, and the All-China Federation of Industry and Commerce. In practice, as the text reports, the United Front could not exist independently of the CCP, reports directly to the CCP, and is a tool used by the CCP for certain projects and activities. But this does not mean it is not important. Chairman Mao Zedong (1893-1976) considered it one of the CCP’ “magic weapons” to defeat its domestic and international enemies. Somewhat misquoting Chairman Mao, President Xi Jinping had proclaimed it the magic weapon in CCP’s arsenal. The ideological principles on which the United Front is based are “uniting with lesser enemies to defeat greater ones” and recruiting available non-Communists as “fellow travelers.” Both formulas date back to Lenin. Under Xi Jinping, the United Front has been elevated, in the president’s own words, to a tool for “rejuvenating the Chinese nation” and try to control “how China is perceived internationally.” The report claims that Xi has ordered the recruitment of some 40,000 new United Front cadres, and that in all Chinese embassies around the world there are now United Front officers in charge of “controlling the narrative” about China in the media and the academia, particularly in the field of human rights, religion, and Tibetan and Uyghur issues. 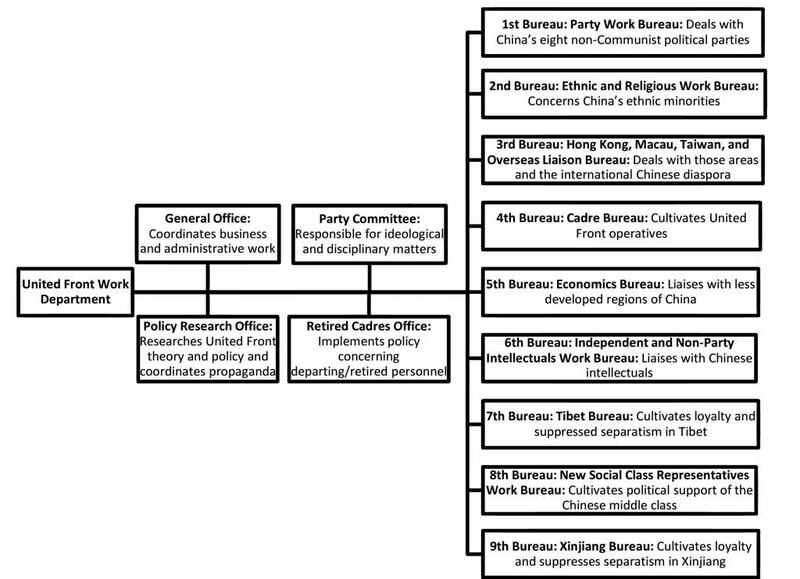 Figure 1 shows the nine different bureaus through which the United Front Work Department (UFWD), which reports directly to the CCP’s Central Committee, operates. Bureau 2 in fact operates in the field of religion, in addition to ethnic minorities, and there are specialized bureaus for Tibet and Xinjiang. With the new laws on religion introduced in 2018, the management of religions in China should pass from the State Administration of Religious Affairs (SARA) to the United Front, although the process is not completed yet. Figure 2 shows how this activity is conducted abroad, in particular through organizations such as the Confucius Institute, which enters schools and universities internationally by offering Chinese language and culture events and courses, and the China Council for the Promotion of Peaceful Reunification (CCPR), now active in many countries to advocate for the “peaceful” return of Taiwan to China. That these organizations are connected with the CCP is somewhat obvious, and their activities have been limited or banned in some U.S. States and universities. However, the UFWD also operates in many other different ways, and the report claims that “sometimes it crosses the line into criminal actions.” Chinese students and business persons in the diaspora are recruited as propaganda agents, and sometimes as spies. If they refuse to be recruited, they are threatened with retaliation against their families in China. Through these more or less voluntary agents, information is collected about Tibetans, Uyghurs, and dissident religious communities abroad. Attempts follow to infiltrate them and to recruit some of their members as informants and spies. Some are clearly non-recruitable, but identifying them allows for actions against their families in China. The UFWD and its agents also harass human rights defenders criticizing China, and recruit academics and politicians. The report notes some blatant cases of Australian politicians, and international academics and journalists specialized in Chinese matters, who have received huge sums from UFWD-affiliated organizations. But this, it notes, is just the tip of the iceberg. More often, money changes hands in an invisible way, and scholars and journalists are routinely recruited to spread only the news the CCP wants to broadcast. Obviously, the phenomenon of fake news defaming religious movements and personalities the CCP persecutes in China is one aspect of this process. The report is a precious document explaining how this happens.